Yet another refutation shot down. There was a time when owning a television station was restricted to the rich and the few. However this all changed with the arrival of the internet, and more specifically youtube. So now if you have a PC and a camera, you can have a TV station of your own. Of course this ability to produce and distribute your own content has made it a crowded and competitive field. And not just in the area of stupid cat videos, but also in fields like chess. There are a number of Chess 'stations' in operation, some connected with other chess resources (such as playing sites) and some existing on their own. A new entry into the market is Bundy Chess. It is a youtube channel run by IM Andras Toth, and has an emphasis on chess puzzles and the demonstration of chess beauty (NB He explains what he means by this in his first video). The channel has only been running for a month but already has plenty of content, with 24 videos up at last count. Each clip runs for between 2 and 6 minutes so you can digest them in bite-sized chunks. Every clip is intended teach you something, so if you are looking for a way to improve you chess, or just to see some very nice puzzles, visit Bundy Chess at youtube. World Champion Magnus Carlsen has been quite busy over the past few days. First off, a new G-Star Raw featuring Carlsen has been launched, even making it as far as my home city of Canberra. Walking past the G-Star Raw store in the Canberra to other day, I pointed his poster out to some work colleagues. "Is he the guy having his hair pulled? He doesn't look very happy about it" was the response of one of my workmates. He has also launched a chess app called "Play Magnus". It is a chess playing app with a couple of extra bells and whistles. The basic app allows you to play against Magnus ate various ages in his chess development (starting at 5 years). Of course you don't actually play Magnus, but a chess engine that has its levels based on the estimated strength of Carlsen at that age. While in general I think that graduated strength chess engines are a good idea, I fear this implements the idea in a flawed way. Based on the few games I have played against it, I suspect the programmers use the move_score = eval + random_number method. While the engine evaluates the position normally, I adds a random value to the final assessment of each move. At the lower levels this value is usually quite big, meaning the program essentially plays randomly. As the program gets 'older', the random value range becomes smaller, meaning that better moves are more likely to be chosen. The problem I have with this kind of idea, is that to beat the program, you simply wait for a big mistake. A better implementation, from a learning point of view, would instead to have a shallow search to start with, and deepen it as Magnus gets older. This way you improve by thinking deeper than your opponent, which is how we normally improve at human chess. Apart from the quibble I still like the program and the ideas behind it. The basic program is free from the Apple App Store, while you can pay to have the adds removed and enable extra features. The third round of the 2014 ANU Masters saw the first appearance of FM Junta Ikeda. Ikeda has spent the past 9 months studying in Japan, with chess taking a back seat. He met strong resistance from Alana Chibnall, and while he achieved an attacking setup in the middlegame there was no immediate knock out. It was only after Chibnall declined the win of the pawn that his chances improved, and Chibnall then walked into a tactic that lost her a piece and the game. IM Andrew Brown scored his third win of the event, after Miles Patterson wheeled out a Benko Gambit. At one stage Patterson had a dangerous looking passed pawn, but this was gained at the cost of an exchange, and Brown was able to use the material advantage to win the game. Andrey Bliznyuk - Fred Litchfield was another game where the win of the exchange proved sufficient. Again there was a faint hpe that a passed pawn might provide some compensation, but Bliznyuk scooped up a couple of central pawns before tragetting Litchfields king. Wenlin Yin scored his first win of the tournament in a fairly wild game against Adrian de Noskowski. 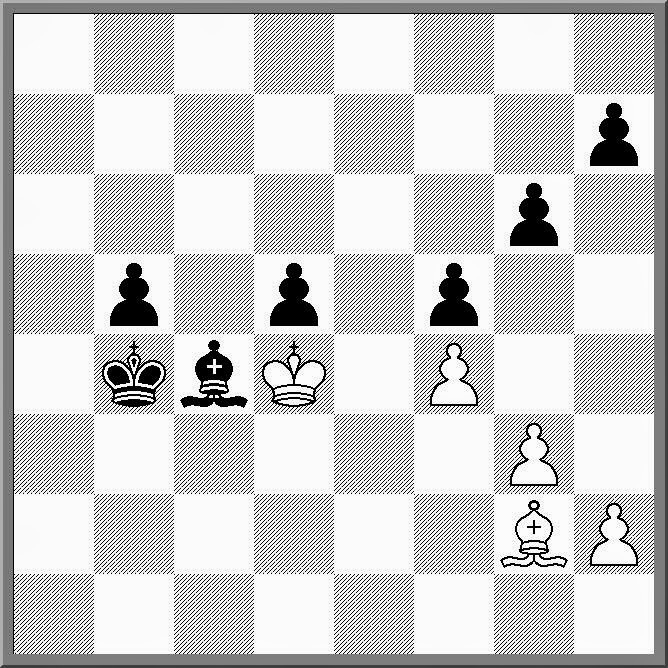 Yin caught de Noskowski's king in the centre, but had to worry about his own king safety. It turned out that Yin's threats were stronger than de Noskowski's and Yin was able to win queen for rook, and then force checkmate soon after. After 3 rounds IM Andrew Brown is on 3 points, with Andrey Bliznyuk and Fred Litchfield on 2. FM Junta Ikeda is on 1/1 with 2 games in hand, while the 5th round game between Brown and Bliznyuk has already been played, with a fighting draw the result. The ACT junior chess season kicked off on the weekend with the ACT Junior Lightning Championship. A good field of 44 players turned up, with Michael Kethro winning the event with 11/11. Along the way he picked up a quick win using an opening trap in the Max Lange. During the post mortem I mentioned that I had walked into a similar trap when I was a junior, but it turns out I mis-remembered my own disaster. Rather than the Max Lange it was in the Two Knights Modern variation (the one with the early e5 for White). Moving my knight to the wrong square allowed a Bxf7 sacrifice, which so unnerved me that later I tried to castle, despite having moved my king to f7 and back to e8! I've just started reading "The Immortal Game" by David Shenk, and I've already come across some interesting points. In the Introduction he talks about his own enthusiasm as a chess player, and remarks that he is "ambivalent about chess". He attributes this to being "put off by the high gates of entry to even moderately serious play". He theorises that moving from "patzer to mere competence" would require untold hundreds of hours of study and play. To me this reads like an exaggeration, the sort of comment made by an 'outsider' who doesn't really "get" chess. I've seen this comment repeated in other forums as well, usually by some explaining why they don't, or often in there words, can't play chess. It is either an unwillingness to learn reams and reams of opening theory, or to spend 8 hours a day studying the classics, or a general aversion to highly competitive atmosphere that chess creates. And while there might be a kernel of truth in what they say, it seems a little overblown to me. Instead I sometimes people either "get" chess ot they do not. Partially this is a technical thing, in that new players quickly understand the point of the game, and are able to improve there play reasonably quickly while assimilating fairly basic information (eg simple checkmates, what the pieces are worth, capturing things for free). But it is also understanding how they fit in to the environment (eg starting at the bottom, knowing that losing is part of the experience etc). And to me this is the real "gates of entry". If you can understand the wider context of what you are doing, passing through successive doors is reasonably straight forward (and you can even understand why some doors are locked). Otherwise it is like being lost in a maze, where the only sensible exit is where you came in. Just noting the milestone of the first 100 entries for the 2014 O2C Doeberl Cup. As in previous years the Premier is the event filling up the quickest, with 49 entries (out of a maximum 90) ready received. The other events are catching up however, with the Major already at the 29 player mark. Based on the numbers for previous years (at the 8 week to go mark), the size of the field will be the largest yet. A puzzle I've lifted off chess.com. It is White to play and win, and is the kind of position you are likely to get at the end of a blitz (or rapid) game, when you only have a few seconds left to find the win. The title of this post is of course a clue. If I came across a link for a Dutch movie called "Love of Wood" I would be vary wary about adding it to my browser history. However , in the case of the movie actually titled "Liefde Voor Hout" there is little to worry about, unless your other half forbids you from watching chess documentaries after dark. Produced in 1979, it "stars" a number of Dutch personalities including Timman, Euwe, and Donner. Having only just been alerted to its existence (by Chessvibes and Chessbase), I have not watched enough to do a proper review. Hopefully I will be able to find the time over the weekend to watch what is undoubtedly a wonderful piece of chess history. Round 2 of the 2014 ANU Masters saw IM Andrew Brown and Fred Litchfield extend their winning streaks to 2 games. In the first game to finish Brown found a nice tactical shot to leave Adrian De Noskowski in an awkward position. De Noskowski then allowed his king to become exposed, and Brown was able to use the subsequent mating attack to win large amounts of material. Litchfield defeated Wenlin Yin when Yin unwisely allowed Litchfield to exchange his queen for two rooks. Yin's king was trapped in a corner, and the two rooks quickly formed a mating net. In the third game of the night Andrey Bliznyuk defeated Alana Chibnall after she vacillated between attack and defence. At first it looked as though the game was going to be a race between attacks on opposite wings, but Chibnall chose the wrong moment to go on the defence, and Bliznyuk quickly overran her position. After 2 rounds Brown and Litchfield lead the tournament on 2 points. However FM Junta Ikeda has a chance to catch them, as he currently has 2 games in hand. Losing games of chess often affects my thinking in the next game. Unlike the Russian's players of old, making a draw after a loss isn't always a good strategy, given the disparate rating differences in a lot of club events. Of course in trying to recover from one bad loss, I managed to lose a second game last week, leaving me with two losses to start my 2014 season. So when I sat down to play tonight I realised I was no longer "chess-thinking". My hands were moving pieces but I was not concentrating on what those moves were doing. So after rattling off a few moves of opening theory I took a deep breath and tried to think about thinking. Fortunately it was a long time control game, so I had a few minutes where I could let my brain readjust itself. I was kind of helped by the fact that (a) the position was simplified and (b) I was a pawn up, but there was nagging suspicion that my brain was going to double cross me at some stage. As it turned out, a couple of pauses at the key moments were very helpful, and I was able to find the right moves at the right time. Picking up the point was nice, but just calculating a few moves ahead was even nicer. One topic I have not really covered on this blog is FIDE Politics. This is a deliberate decision of mine, given the fact that I work on a number of FIDE Commissions. However it is not because I am worried about keeping my job(s) but instead to do with the line between being a dispassionate blogger and an involved one. Basically the issue is that I know, and work with a number of people involved in the upcoming FIDE elections (on both sides of the fence). I am also an office bearer with the PNG Chess Federation, and will have input on who the PNGCF decide to vote for. So I feel it would be difficult for me to blog on the issue (and there are so many posts that could be written) while taking a 'hands off' approach to my posts. Some of you might think this is a cop-out and I wouldn't disagree with this point of view. Those of you who have spoken to me privately probably already know my opinions on the FIDE Election (and the candidates), but for this election these opinions will remain private. I had a couple of minor disputes that needed handling at Street Chess today. One involved a spectator (in fact another player) pointing out 'flag fall' in a game, which was then complicated by the fact that the other player left his own clock running, so by the time I reached the board, both flags were down, and a third (or fourth party) has even begun to set the pieces up again. "Draw" was the only word I could utter when faced with such chaos. The other involved that old bug bear of players moving before their opponent has pressed the clock. "It's just not cricket!" exclaimed one player when he found his opponent doing this. Unfortunately for the player we were following the Laws of Chess meaning that there is nothing explicitly stopping a player from doing this (NB It has been discussed at some length by the FIDE Rules Commission, without coming up with any radical new proposal). My advice was to simply press the clock anyway, (a) forcing the opponent to press his own clock as he should and (b) possibly encouraging the opponent to play a second move in a row, when of course something illegal has occurred. "House of Cards" was a very successful British political drama, that eventually underwent an American remake. I've seen all of the original, and around the first half of the remake (watched while flying to Europe and back). In the end there are enough differences between the characters in the series, as well as between US and British politics for both to stand on their own, rather than being compared directly together. The second US series is just about to start and at least one publication is using chess to explain the Machiavellian goings on in the first series. Paste Magazine has a summary of the all the episodes from Series 1 laid on a chess board. Each of the main characters is a piece, and as they get 'removed' by Frank Underwood (played by Kevin Spacey), they get taken off the board. While the board itself is only 6x6, and all the pieces seem to be the same colour, I do give credit for the imaginative attempt at utilising the "politics as chess" metaphor. If you are a fan of the show, or just want to see the visual representation, the article is here. As I use Wikipedia to research a lot of my chess articles, it is only fair to give a plug to this excellent website. One area I admit to not really visiting is the Chess Portal.This is kind of a 'Front Page' of chess articles and links, with a weekly featured article, plus links to other articles. It also has a "Things you can do" section at the bottom, with suggestions about what articles need work, or even new topics to add. I know IA Gary Bekker has done a large amount of work adding biographies of contemporary chess players, and I've come across good works by other Australian contributors. There is even a big article on Bughouse (Transfer Chess), which may reveal a few secret strategies for the next tournament. So if you wish to contribute to the effort of extending chess knowledge, or just want to have a leisurely browse, head over to http://en.wikipedia.org/wiki/Portal:Chess to get your fill. The 2014 ANU Masters began this evening, with a slightly smaller field than previous years. The 8 player round robin brought together tournament winners from the previous year, as well as a couple of invited players to add a bit of starch to the field. Top seeds are IM Andrew Brown and FM Junta Ikeda, with Andrey Bliznyuk the highest rated ANU regular. The first round saw 3 games played, and they were all hard fought. Wenlin Yin and Andrew Brown started with Yin making all the threats, while Brown was mainly concerned with keeping his position together. But once both players were short of time, Brown's position improved and he was able to win material while harrying Yin's king. Fred Litchfield won a piece for 3 pawns against Alana Chibnall, but offered his opponent a draw, apparently not trusting his position. However it was turned down, and once forced to play on, found that the extra piece was enough to clean up the pawns and win the ending. Andrey Bliznyuk built up a winning position against Miles Patterson after a nice pawn sacrifice in the middle game, but running short of time avoided one trick, only to walk into a bigger one. 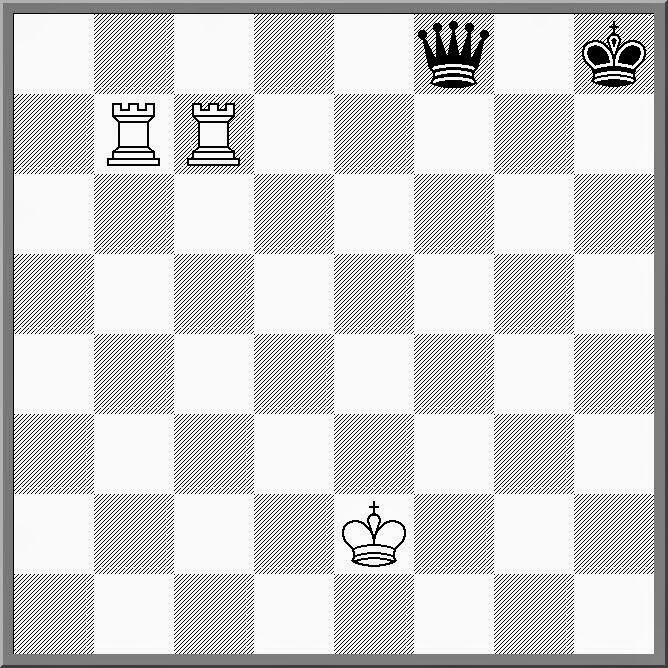 Demoralised by the turn of events he then moved his king to a square that allowed a mate in 1. The following game is one I annotated for an upcoming article on Computers and Chess. It comes from the very first Correspondence World Championship, and given its vintage, was obviously played without computer assistance. Nonetheless the moves chosen have a very high correlation with Rybka 3.0, searching to fixed depth of 13 ply. The main reason for this is that it was a highly tactical game, and lots of moves were forced. Nonetheless it still impresses me that both players were able to analyse the tactics to the level that they did. Riding the bus to work gives me a chance to catch up on some chess reading. One book I need to read, but never have the time to, is "Chess Strategy for Club Players" by IM Herman Grooten. While it is intended as a training book, it is possible to dip in and out of the chapters. Today I had a look at the "Harmony and coordination" chapter, and discovered the concept of "Tai Chi Chess". In Tai Chi Chess the player avoids the fight until absolutely ready, while the opponent expends energy trying to hit a target that isn't there. The example game given was a win by IM Johan Van Mil over GM Lothar Vogt. The key ideas of Tai Chi Chess are demonstrated from move 20 onwards, where Black decides against grabbing the b2 pawn, and instead co-ordinates his pieces. Move 41 for Black is also worthy of notice, as he realises the White knight would be "best placed beside the board". I'm slowly making my way through the 'Culture Series' of novels by the late Iain M. Banks. They deal with a 'post scarcity' society, where there is no requirement to work, as everything is essentially provided for you. Of course people still have roles in this society, but they are roles that are not imposed upon you by an outside agency. One question that occurred to me abut such a society was: Would people who played physical sports receive higher recognition than people who played mind sports? Bank's himself provides some sort of answer in the second book of the series 'The Player of Games', but would a society that did not have to physically labour reject all forms of physical competition, or would they instead embrace it as something outside the norm? Two co-ordinated rooks should be able to beat a queen in most positions, and to support this claim, here is a study from Henri Rinck. It is White play and win. But if you find it too difficult here is a clue. In the main line, no piece moves off the rank it starts on, until White lowers the boom! Note: This post does not condone or encourage the excessive consumption of alcohol. The Winter Olympics are starting in a few hours, but to be honest I'm not that fussed. One interesting story is about the quality of accommodation for the journalists, but if the 2010 Chess Olympiad is a guide, the Russian Government will just throw money at the problem until it is fixed. In past years there has always been chatter about Chess being added to the Winter Olympic schedule, on the grounds that it is an indoor sport, but I'm not even hearing that talk this time. Of course chess will have a presence at these games, via the commentary box. If you do need an excuse to have a tipple, then maybe taking a shot every time you hear a variant on the tried and true "It's a game of chess out there". Of course if you want to kill as many brain cells as possible, try watching the Curling, which is *always* described as "chess on ice". Sometimes final rounds can a bit dull, while other times they can be hard fought. It often depends what is at stake. In that latter column comes the following game from the 2014 Gibraltar Congress. With Vassily Ivanchuk leading by half a point, Maxime Vachier-Lagrave threw everything into an attack which looked good (from a spectators point of view) but was never quite winning. Eventually Vachier-Lagrave reached a position where he ran out of new pieces to sensibly sacrifice, and so a draw by repetition was the best result. This leaves Ivanchuk still in the lead, but with a number of games in progress, a tie for first (plus a playoff) is still a likely result. At first I was wondering if I was witnessing the refutation of 1.e4 as most of the moves seemed pretty standard, but after 7.Ndb5! I realised that half the worlds openings were safe after all. Turns out that this position has only occurred twice in my database, the first time in 1857, the second in 1991. The 1857 games was played between Morphy and Paulsen, with Morphy winning after 7. 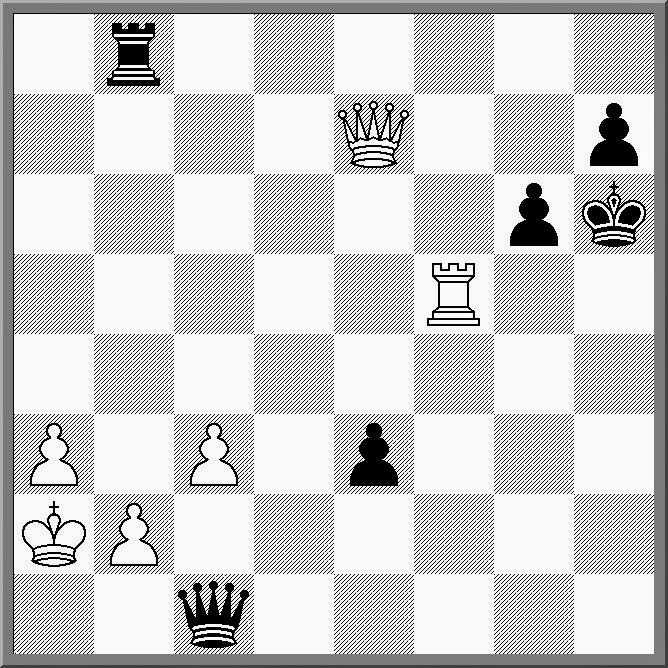 ... Bxe3 8.Rb1 Qxb1 9.Nxb1 Bf4 White lost even more drastically in the 1991 game after 7. ... Qb4 8.Rb1. The game I was watching instead continued 7. ... Bb4 8.Bd4 (8.Bd2! is stronger) when White had a huge advantage, but Black amazingly found enough tricks to eventually draw. There is an interesting report produced by the FIDE Development Commission concerning the number and activity level of chess players in each country. It looks at the number of FIDE rated players, the number of swiss and round robin tournaments, and the number of players who play in different countries. For example, the number of FIDE rated players has doubled in the 2008-2013 period, with Spain having the greatest number of rated players. (I'm not sure what the cut off date of the report was, as recently it was reported that India is now No. 1). In 2013 France organised the greatest number of Open tournaments (ie Swiss events), while Denmark(!) was number one for round robin events (Australia was 14th). Spain, India and France were close together at the top of the 'most number of games' table, while Ireland clocked up an impressive 30,665 FIDE rated games in 2013. Germany seem to produce the greatest number of chess 'tourists' (ie playing in another country) while France attracted the most visitors. The author of the study, Martin Huba, even compared the inflow and outflow of players to come up with a kind of 'balance of trade' figure. He gave Slovenia as an example of a country that sends more players across the borders, than takes them in, leaving a chess player 'deficit'. The full story can be found on the FIDE website or at this link. The 2014 Zurich Chess Challenge provided more entertainment overnight, in the form of the Nakamura - Carlsen game. Before the game Nakamura was talking himself up as the future threat to Carlsen's title, and up until move 37 he might well have been. But he chose a move that he thought was winning (as did the on-site commentators) but turned out to simply throw away his advantage. And in what is a familiar script when facing Carlsen his position went from winning to equal and then losing in a surprisingly short time. After the game most comments concerned how amazing the collapse was. Of course at the highest level it is incredibly rare to see a game end this way, but visit any local club or tournament and such tragedies are more common place. For example, the diagrammed position comes from a game I played on the weekend (it was G/15m). I was white, and am completely lost in this position. Yet amazingly I managed to win the game in the space of 10 moves. My opponent (who was behind on the clock), thought the b pawn was going to queen, but missed my plan of h3-g4-gxf5-h4-Bh3-Bxf5 when I am covering b1 and the f pawn is running. Even then it is a draw, but having missed the win, he took one move too long to get the bishop back to e8, and the point was mine.